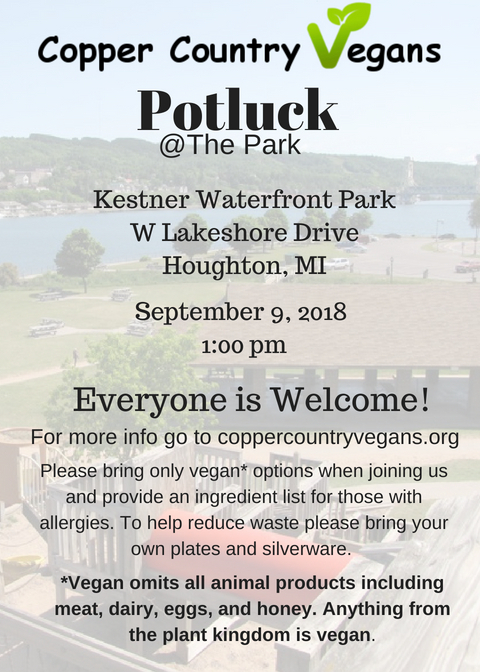 Please join Copper Country Vegans for a potluck at the Kestner Waterfront Park in Houghton on Sunday, September 9th at 1:00pm. We will be awarding prizes for best dish and best dessert. We ask that you only bring vegan items when joining us and that you provide a list of ingredients for any food dish you wish to share to accommodate those with allergies. Also, to help reduce waste please bring your own plates and utensils. Vegan food omits all animal products including meat, dairy, eggs, and honey; anything from the plant kingdom is vegan. We’re always looking for volunteers to help with this or other events. Send us a note if you’re interested.